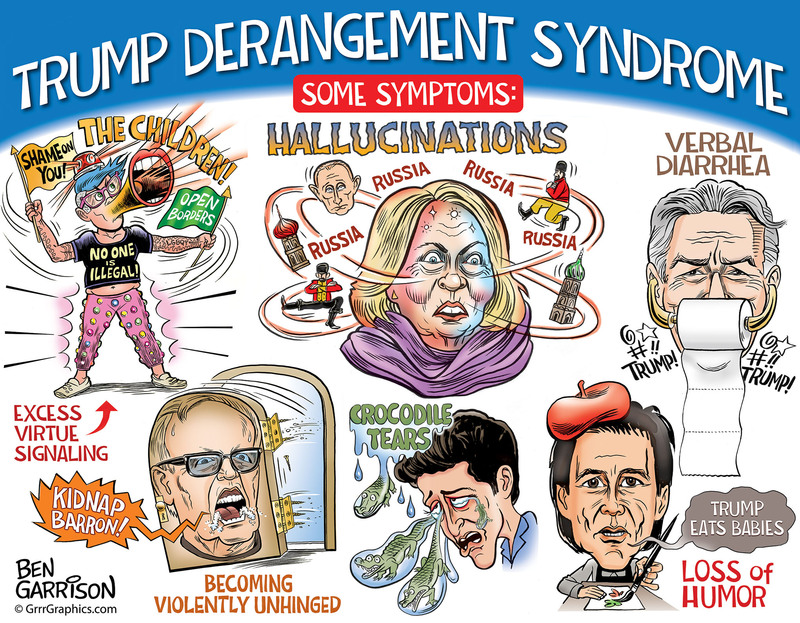 Trump Derangement Syndrome (TDS) is a mental condition in which a person has been driven effectively insane due to their dislike of Donald Trump, to the point at which they will abandon all logic and reason. Symptoms for this condition can be very diverse, ranging from hysterical outbursts to a complete mental break. TDS can also often result in the sufferer exhibiting violent, homicidal, or even genocidal desires. Sufferers have also been known to wish direct self harm on themselves (such as increased taxes, a desire for an economic recession, and even nuclear war), provided that the action might in some way hurt Donald Trump. Paranoia is also a common symptom of TDS. Sufferers have been known to believe that they are in some way being persecuted, and in some cases believe they are about to be a victim of genocide. The paranoia does however not seem to be bad enough to make sufferers act on their beliefs to the extent of attempting to actually leave the United States. If properly treated, sufferers of TDS can make a full recovery. Many sufferers have been known to grow out of TDS, yet many can only be cured by having their condition directly treated through the application of logical reasoning. It is also known that products containing soy can exasperate the condition. "Did you hear what Sarah said the other day? She was saying how the US is more authoritarian than North Korea, and that we're actually the bad guys! She says she wants to move to North Korea when she graduates!" "Yeah I know.. she has a serious case of TDS.."
"Not for someone doing gender studies, it isn't!" [+5] - farmerman - 07/14/2018Qppqrently your life has hit a new peak. This has been made a "selected thread" Congratulations. Arent you glad you put on clean underwear last Monday? A possible victim here, eh? If anyone ever needed an extended course in gender studies, it's that thing in the video clip I just posted, eh? I mean, what it that!? Male, female, hermaphrodite, some new kinda critter, or what? I'm not the author of that TDS definition masterpiece, although I did heavily spellcheck it. It came from the Urban Dictionary entry that I linked. Qppqrently your life has hit a new peak. This has been made a "selected thread"
Congratulations. Arent you glad you put on clean underwear last Monday? What in the world is a selected thread? Another poor girl who has apparently been afflicted by this horrible mental disease, eh? I think she sums up her position pretty clearly when she says: "I hate this ******* country!" But she aint plannin on leavin, so I guess she's just stuck with trying to destroy the country she hates so much. Oh that? I always figured that that list was automatically generated based on some sort of thumb rating algorithm applied to threads created within the past few days -- something like the "list of popular threads" but with a more stringent age requirement ensuring that only the most recently-created threads are considered. Of course, that's an assumption on my part. I don't actually know. Was that girl being arrested at the very end of the video? No, but she later was. The guy didn't want to prosecute her, but later changed his mind after he caught all kinds of **** from other students. She was charged with a felony because she had "forcibly taken property from the body of a person," or something like that. She was so damn proud of herself that she later posted a video of herself ripping it off his head. University chancellor Kim A. Wilcox released a statement afterward promoting “respectful dialogue” – though Vitale said it didn’t go far enough in condemning Macias’ behavior. Vitale alerted authorities after the incident but declined to press charges... But then Macias posted a bizarre, profanity-laced “SnatchAHat” video online, which eventually went viral, that showed her physically removing the hat from his head – and then verbally attacking him for promoting “genocide.” By showing that she took it off his person, the crime rose to the level of felony, Vitale said campus police told him. And now, he says, he wants her arrested. Did you hear about that college where nutcase liberals lynched a professor for saying that it was wrong for them to create a "no whites" day? It's ironic that those screaming the loudest for "equity" and tolerance are the most inequitable and intolerant. That those who protest "racism" 24/7 are the most racist. Those denouncing "fascism" are the most fascist. That those who scream about "genocide" are the most violent (which is, of course, completely justified by the need to exterminate dangerous people who perpetrate the most vicious and savage violence imaginable by wearing hats, and ****). My experience has been that the "people of color" who buy into this victimhood mentality truly hate whites. Are those that denounce homosexuality the most also the most homosexual? She was charged with a felony because she had "forcibly taken property from the body of a person,"
America and American never do anything like that!! If it's Trump you're talking about that should be STD.